It's easy to save cash with Nimes vacation packages on Expedia. You'll have heaps more time to plan the fun stuff — and more spending money! Smart travelers who secure a package deal on Expedia will save up to C$590*. You can select from more than 400 partner airlines and 321,000 worldwide properties on our global database of accommodations and flights. Fly with who you want, stay where you like — now that's the perfect vacation! About to jet off on your Nimes vacation? Don't know what sorts of things to add to your travel itinerary? Don't fret — we'll give you a few pointers. You'll never have to worry about getting bored in this alluring city. The Maison Carree and the Temple of Diana will keep you busy. The Fountain Gardens and Nimes Arena are a few more terrific attractions that'll grab your attention. Are you interested in the stories of human history? Experience an intriguing insight into the realities of yesteryear at Archaeology Museum. Visitors in this destination have heaps of options. History is the ultimate teacher. Drink in the knowledge and learn from times gone by at Old Nimes Museum. Still got some time on your hands? Looming over the skyline, Magne Tower is difficult to miss. Stand under it, cast your eyes up and marvel at this grand old structure. Travel isn't just about marking off new destinations. It's about the friends we make and the experiences we have on the way! To view a complete list of activities, head to the Nimes things to do page. 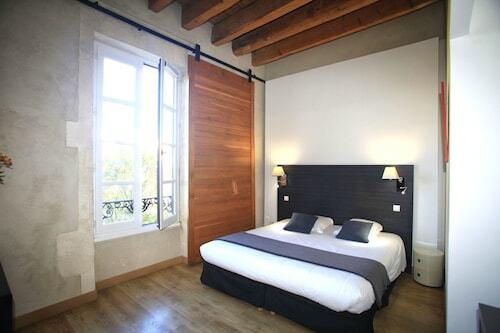 Expect a large variety of accommodations when you jet off to Nimes. With 40 properties available, it won't be a problem booking a nice place to sleep for your cheap vacation or luxury getaway. 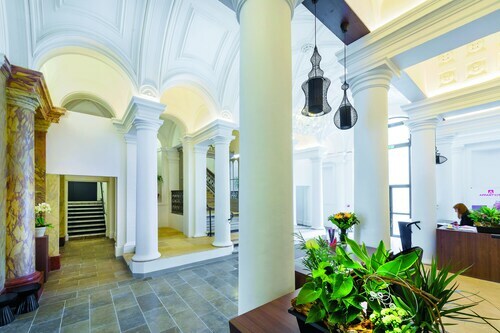 It's not every day you get to spend time away, so why not spend a few nights in a fancy room at the Hôtel & Spa Vatel (140 Rue Vatel) or the Hotel Imperator (15 rue Gaston Boissier)? With five-star service and first-rate amenities, you're bound to feel like a VIP! Alternatively, if you're traveling on a budget, the Des Tuileries (22 Rue Roussy) or the Hotel Central (2 Place Du Chateau) may be more to your liking. Get through security, shuffle onboard, check your boarding pass for your allocated seat and get comfy! Your exciting trip to Nimes is just a plane ride away. After coming in to land at Marseille - Provence Airport (MRS), you will be around 50 miles (80 km) from the downtown area. Situated in Nimes, this hotel is within a 15-minute walk of Nimes Museum of Fine Arts and Nimes Arena. Nemausus and Musée de la Romanité are also within 10 minutes. Nîmes Station is only a 2-minute walk. Situated in Nimes, this residence is steps from Musée de la Romanité and Nimes Arena. Nimes Museum of Fine Arts and Archaeology Museum are also within 10 minutes. Nîmes Station is 7 minutes by foot. Located in the heart of Nimes, this golf hotel is within 1 mi (2 km) of Nemausus and Nimes Arena. Parc Expo Nimes and Nimes Museum of Fine Arts are also within 1 mi (2 km). Nîmes Station is 16 minutes by foot. 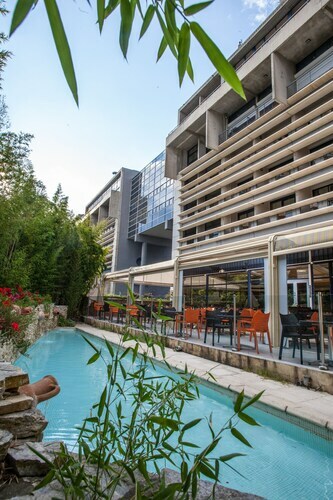 Situated in the business district, this spa hotel is 2.5 mi (4.1 km) from Nimes Museum of Fine Arts and 2.6 mi (4.1 km) from Nimes Arena. Costieres Stadium and Temple of Diana are also within 3 mi (5 km). Nimes St-Cesaire Station is 16 minutes by foot. 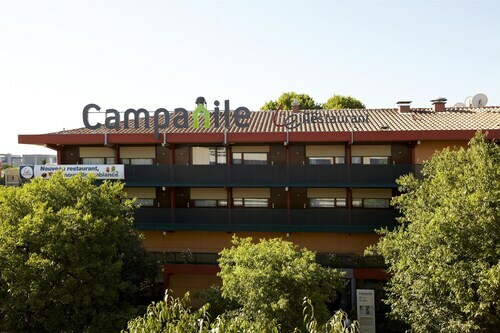 Located in the heart of Nimes, this hotel is within 1 mi (2 km) of Parc Expo Nimes and Nimes Arena. Nimes Museum of Fine Arts and Costieres Stadium are also within 15 minutes. Nîmes Station is 16 minutes by foot. Located in the heart of Nimes, this hotel is within a 10-minute walk of Nimes Arena and Nimes Cathedral. Maison Carree and Office de Tourisme de Nimes are also within 15 minutes. Nîmes Station is only a 5-minute walk. Located in the heart of Nimes, this residence is within a 10-minute walk of Nimes Museum of Fine Arts and Nemausus. Archaeology Museum and Nimes Arena are also within 15 minutes. Nîmes Station is only a 3-minute walk.